Galleria Africana is your one stop online source for exclusive, and one of a kind paintings and collectibles, including, not limited to various original artworks, oils, serigraphs, lithographs, sculptures, ceramics, bronzes and home furnishings, from the sub-African continent. We feature professional artists creating oil paintings for all types of decorative styles, themes, and colors, for your home or office needs. Our artists specialize in fine abstract work, mixed media on canvas and paper. Also at Galleria Africana, we feature unique sculptured wood and metal pieces, and an array of home furnishings, included but not limited to living room, dinning and bed room furniture. 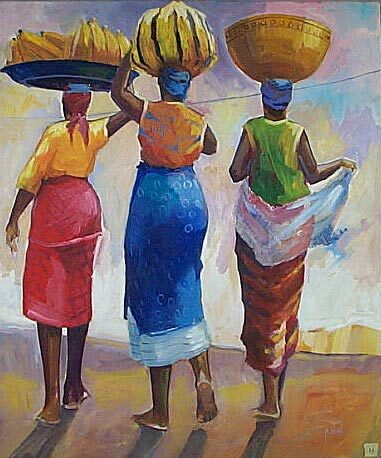 At Galleria Africana color abounds in these figurative and abstract oil paintings. Hence, the varied content reflects African observations and feelings on the human condition and behavior. The Diaspora reflects our impressions and our natural environment of landscapes tells our African story.